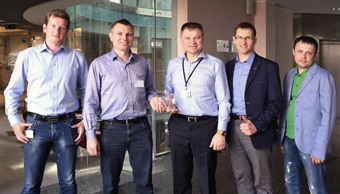 London, 14 May, 2014 – Leading Latvian operator, LMT, and Danish OSS supplier, 2operate, received innovation award from Global Telecoms Business. 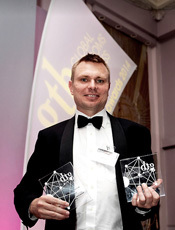 At the annual GTB Innovation Summit held Wednesday night at the Sheraton Park Lane Hotel in central London, Latvian service provider, LMT, and Danish network management software specialist, 2operate, were announced as winners of one of the Global Telecoms Business (GTB) innovation awards in the wireless network infrastructure category. The award was given to the two winners for their joint project on Process Improvement in Customer Care using Artificial Intelligence which was completed in 2013. With more than 1 million subscribers, widest network and biggest turnover, LMT is the leading mobile operator in Latvia offering a range of high-quality and value added services and the widest network coverage. LMT’s mobile communication network covers more than 99% of the territory of Latvia, and LMT was first to provide mobile 4G in the country. Today, more than 50% of the Latvian population is able to enjoy mobile 4G from LMT. 2operate is Europe’s most innovative OSS provider, according to market research by leading analyst firm, Frost & Sullivan. 2operate provides the most user friendly OSS tool in the market today. User friendliness is partly achieved by using automated network element diagnostics based on advanced mathematics. Automated diagnostics means that non-technical staff gets an understanding of raw data which otherwise requires an engineering background. Technical staff also benefit, since automation helps determining the root cause of problems much faster than with traditional OSS tools. 2operate is based in Aalborg, Denmark. It was founded in 2009 by a team of experienced telecom executives and software experts to commercialize IPR developed under two European research projects on network automation. 2operate builds upon a strong combination of core technical skills and telecommunications business processes understanding. The company mission statement is “Simplifying Troubleshooting” which clearly states how its solutions differentiate.